In that spirit Elder William Grant Bangerter returned to Utah for general conference at the invitation of President Spencer W. Kimball, feeling, he says, that some new responsibility awaited him. He had been called to open the Portugal Lisbon Mission in November 1974, and will serve there until July this year. Brother Bangerter has been a building contractor with his brother Samuel and has had considerable involvement in real estate development in Arizona and Utah. “My brother’s cooperation during my activities in the Church has been most valuable,” he says. Elder Bangerter was ordained a high priest soon after his return from his first mission, when he was called to serve in the Granger Ward bishopric. During World War II he was stationed in Douglas, Arizona, as a United States Army Air Force pilot and training squadron commander. Returning to Utah after the war, he served successively as stake M Men leader in Oquirrh and North Jordan stakes, stake Aaronic Priesthood secretary, bishop of Granger Ward, president of North Jordan Stake, president of Granger Stake, vice-chairman of Pioneer Welfare Region, and as a member of the executive committee of the Board of Trustees of the Latter-day Saints Hospital in Salt Lake City. He was called to preside over the Brazilian Mission in 1958, and returning to the United States in 1963, he was called to the Church Home Teaching Committee. In 1967 he was called as a Regional Representative of the Council of the Twelve, where he served seven years. Elder Bangerter’s first wife, Mildred Lee Schwantes, passed away in 1952. They had four children: Lee Ann (Mrs. Richard Lorenzon), Cory William and Glenda (who filled missions in Brazil), and Mildred Elizabeth (who died at birth in 1951). 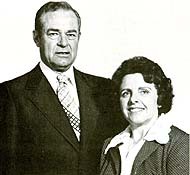 In October 1953 he married Geraldine Hamblin, and they have had seven children: Julie (Mrs. Ramon P. Beck), Grant Hamblin (presently a missionary in Spain), Howard Kent, Peggy Brasilia, Glenn Paulo, Layne Rio (the latter three being born in Brazil), and Duella. The five youngest accompanied their parents to Portugal and attend an American school there.